MicroRNAs are short (18-24 nucleotide), non-coding RNAs that regulate gene expression. miRNAs are differentially expressed in many diseases and can serve as important biomarkers. However, miRNA detection is challenging for several reasons. miRNA biogenesis is a complex process that includes the presence of precursor (pre) and primary (pri) miRNAs and sequence isoforms known as isomiRs, which give rise to miRNAs of varying lengths and sequences. Additionally, miRNAs are present at low levels, comprising ∼0.01% of the total RNA mass in a given sample. In many cases, additional extraction and purification steps are necessary to isolate the miRNA fraction, but each additional processing step risks further degradation and loss of the miRNA of interest. Thus, an optimal method for miRNA detection must have minimal sample handling and processing steps, high specificity for differentiating similar miRNAs, and high sensitivity for detecting miRNAs present at low concentrations. 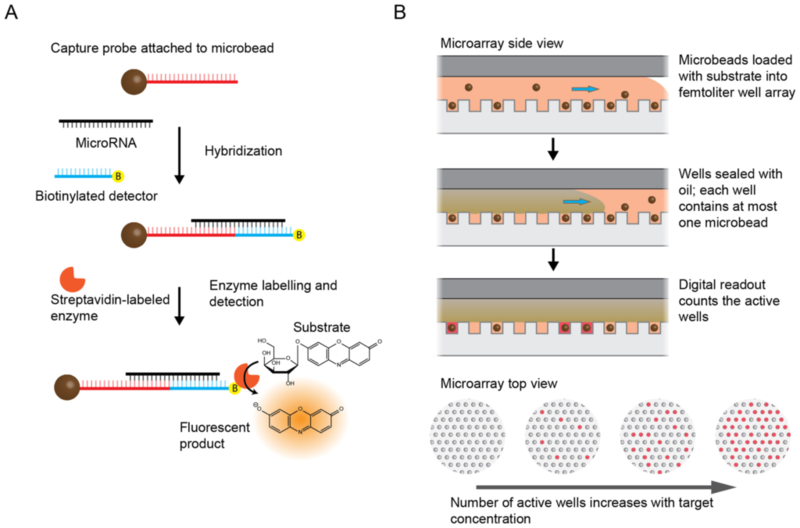 To overcome these limitations, we developed an approach using Single Molecule Array (Simoa) for ultra-sensitive detection of microRNAs. The detection limits of this method are in the femtomolar range. Additional advantages of this approach include high specificity, ability to quantify, multiplexing capabilities, no reverse transcription, and no amplification.